Draft: 1999, Montreal Expos, 2nd rd. Attended Redan High School located in Stone Mountain, Ga., where he played basketball and baseball...In December 2003 his Redan uniform No. 7 was retired...Had scholarships to play both football and baseball at the University of Georgia, but elected to sign with the Montreal Expos after being selected in the second round of the 1999 draft...In 1996, he was a bat boy during the Olympics...His sister, Posha, played in the WNBA, and his two brothers, P.J. and Jamil both played minor league baseball. Hit .291 and tied Joey Votto for the team lead in doubles with 34, his highest total since 2011...In his last 63 games beginning 7/6, hit .344 (84-for-244),fourth-highest in the Major Leagues...In his last 45 appearances beginning 8/3, hit .356 (62-for-174, sixth-highest in MLB...His 10 three-hit games ranked second on the club behind Eugenio Suarez's 11 such games...His 41 multi-hit games ranked second to Votto's 48...From 5/4-5/7, hit five of his 11 home runs during a four-game streak, one shy of the club record for homers in consecutive games...Between the two-homer games on 5/7 vs. MIL and 8/6 at PIT, went 72 games and 286 at-bats without a home run, the longest homerless streaks of his career (45 games, 5/27-9/1/03 and 168 at-bats, 5/14-6/26/11)...Missed games on 4/6 and 4/7 vs. Philadelphia with a stomach virus, then on 4/8 vs PIT hit the first pitch he saw for his first homer of the season (solo shot off Francisco Liriano)...On 7/8 at MIA suffered a hairline fracture of his left hand when he was hit by a Jose Fernandez pitch, but did not miss a game. Hit .291 and tied Joey Votto for the team lead in doubles with 34, his highest total since 2011...in his last 63 apps beginning 7/6 hit .344 (84-244, 19 2b, 5hr, 33rbi), fourth-highest in the Major Leagues...produced a team-high three 10-game hitting streaks (16g, 7/5-7/29; 13g, 5/25-6/10; 10g, 9/9-9/20)...his 10 3-hit games ranked second on the club behind Eugenio Suarez' 11 3-hit games...his 41 multi-hit games ranked second to Joey Votto's 48 multi-hit games...from 5/4-5/7 hit 5 of his 11 home runs during a 4-game streak, 1 shy of the club record for HR in consecutive games and including 2 homers in the final game of that stretch (5/7 vs Mil)...after that 2-homer game on 5/7 didn't homer again until 8/6 at Pit, when he again homered twice...between the 2-homer games on 5/7 vs Mil and 8/6 at Pit went 72g and 286 at bats without a home run, the longest homerless streaks of his career (45g, 5/27-9/1, 2003 & 168ab, 5/14-6/26, 2011)...missed games on 4/6 & 4/7 vs Phi with a stomach virus, then on 4/8 vs Pit hit the first pitch he saw for his first homer of the season (solo off Francisco Liriano)...on 7/8 at Mia suffered a hairline fracture of his left hand when he was hit by a Jose Fernandez pitch...played the next 2 days leading into the ASG (3-8, 1 2b, 3rbi). Was a finalist for the Rawlings Gold Glove Award...led the team in hits, 4-hit games (3) and starts batting leadoff (64)...ranked eighth in the NL in hits and led the Reds in that category for the fifth time in 10 seasons...struck out just once every 9.2 plate apps, sixth-best ratio in the league...batted .294, his highest BA since 2011 and the second-highest of his career...was 1 of only 5 players in the Major Leagues with at least 19 doubles, 12 homers, 70 RBI and 23 stolen bases (A.J. Pollock, Starling Marte, Lorenzo Cain, Ryan Braun)...after the All-Star break hit .314, 11th-best in the National League... on 7/30 vs Pit became the only player in Major League history to produce in a game 4 hits, 2hr, 7rbi and 2 steals (since the RBI became an official statistic in 1920)... was the first Reds player with 7rbi in a game since Javier Valentin had 7 on 7/17/05 vs Col...the jersey he wore that night was sent for display at the Hall of Fame in Cooperstown...on 6/28 at NYM hit his fifth career leadoff HR as the first career batter faced in the Major League debut of Mets starter Steven Matz...in the 13th inning of the 5-4 win on 6/25 at Pit snapped the 4-4 tie with a homer off Rob Scahill...on 7/4 vs Mil made his 900th career start next to 1B Joey Votto...in the 10-run sixth inning on 8/24 vs Det produced a 2-run HR and 2-run triple, the first player with a triple and homer in the same inning since Tor's Edwin Encarnacion did it on 5/7/14 vs Phi...the 2-run HR produced career RBI 800 and 801...on 4/17 and 4/18 at StL committed errors in consecutive games for the first time since 8/20 and 8/21, 2013 vs Ari...on 5/25 vs Col made the 1,500th appearance of his career...in the 11th inning of the 5-3 loss vs Cle on 7/19 made is sixth career appearance at SS, his first since 7/25/07 vs Mil...on 10/1 vs Cubs produced his 300th career double (off Justin Grimm)...on 10/2 at Pit produced his 1,700th career hit (single off Joakim Soria)...missed starts with a sprained left big toe (5/13-5/14), strained left groin (6/10-6/13), sore left thumb (6/24, 6/29-6/30) and inflammation in his right biceps tendon (8/20-8/21). Despite missing more than a month with injury tied for the team lead in doubles (25) and led the club in starts batting third in the order (69gs)...also hit leadoff (1gs on 9/25 vs Mil), second (12gs), fourth (19gs), fifth (17gs) and sixth (3gs)...from 7/11-8/17 missed 33g following surgery to repair the torn ligament in his left thumb, an injury suffered while diving for a ball in the eighth inning on 7/9 vs the Cubs...the Reds went 12-21 in his absence...returned on 8/18 and in his last 35 apps of the season hit .250 (1hr, 11rbi)...in 86 apps prior to the injury hit .272 (7hr, 40rbi)...was a finalist for the Rawlings Gold Glove Award...for the fifth consecutive season was rated by field managers the NL's best defensive second baseman...for the third time in his career led National League second basemen in fielding percentage...committed his only errors on 4/5 at NYM in the Reds' fifth game of the season and on 9/19 at StL in the 154th game...between those miscues produced a career-high 107-game errorless streak (4/6-9/16), a single-season club record for a second baseman and the longest in the Major Leagues in 2014 by a player at that position...with just 2 errors in 525 total chances (.996), tied Bret Boone's 1997 club record for fewest errors in a season by a second baseman but fell 82 chances shy of Boone's team mark for fielding percentage at that position (.997, 607tc)...his 11 doubles in May tied for the most in the National League...on 8/20 at StL singled off Lance Lynn for the 1,500th hit of his career...from 6/6-6/17 did not strike out over 43 plate apps, the third-longest streak of his career (46, 7/5-7/20, 2013 & 45, 5/21-5/30, 2011)...with 2 outs in the 12th inning of the 15-inning, 4-3 win on 5/19 at Wsh made a game-saving diving catch on Wilson Ramos' line drive that stranded the winning run on third base...in the ninth inning of the 11-inning, 7-3 win on 6/28 at SF, celebrated his 33rd birthday with a 2-run HR off Sergio Romo that erased a 1-0 deficit...was his third career go-ahead homer in the ninth inning or later (5/20/03 for Cle vs Det off Matt Roney, 7/15/11 for Cin vs StL off Fernando Salas, both in the 9th inning)...with 1 out in the eighth inning of the 7-0 loss on 9/16 at Chi doubled for the only hit off Jake Arrieta. Was an All-Star for the third time in 4 seasons, a starter for the first time, and won his fourth Rawlings Gold Glove Award after leading National League second basemen in games, starts, putouts and assists...was a finalist for the Louisville Slugger Silver Slugger Award...was 1 of only 6 players in the NL with at least 100rbi...became the first Reds 2B with 100rbi since Joe Morgan in 1976 and the first Major League 2B since Dan Uggla in 2010...tied Ari's Paul Goldschmidt for the Major League lead with 19 game-winning RBI and ranked third with 35 go-ahead RBI (Det's Miguel Cabrera 37, Goldschmidt 37)...with the bases loaded went 11-for-18 with a grand slam, tied Bos' Mike Napoli for the Major League lead in hits and tied Pit's Justin Morneau for third in RBI (24; Napoli 31, Jay Bruce 26)...in the batting order moved from second to fourth following the Opening Day injury to Ryan Ludwick and through 8/27 made 122 of his next 123 starts batting cleanup...on 8/28 returned to the second spot and finished the season by making 22 of his 27 apps in that hole (.253, 13r)...overall hit .240 batting second (2hr, 6rbi) and .265 batting fourth (16hr, 96rbi)...from 5/5-6/13 hit .338 during an 18-game road hitting streak...in the 6-2 win on 6/10 at Cubs tied a club record for most RBI in a game by a player who drove in all the runs (6, Babe Young in 1947, Johnny Bench in 1974)...from 6/2-6/5 missed 4g after he was hit on the left forearm by a Tony Watson pitch on 6/1 at Pit...was bothered by the injury the rest of the season...in the 13th inning of the 3-2 win on 4/20 vs Mia, on his bobblehead giveaway day, drove in the game-ending run with a sacrifice fly off Steve Cishek...hit his 150th career HR on 4/8 at StL (off Jaime Garcia) and his 150th as a Red on 5/24 vs Cubs (off Hector Rondon)...in the 2-0 win on 8/12 at Chi hit a 2-run HR off Travis Wood...on 8/31 at Col fell a single shy of the cycle...on 9/4 vs StL hit a solo HR off Shelby Miller for his 100th RBI of the season...in the National League's 3-0 All-Star Game loss at Citi Field batted leadoff and went 0-for-2...in 6 starts at 2B for Team USA in the World Baseball Classic hit .269 (7-26, 1 2b, 1rbi, 5r)...was the club's nominee for the Branch Rickey Award. For the third time in 6 years won the Ernie Lombardi Award as the Reds' Most Valuable Player in voting of the local chapter of the BBWAA ... finished 13th in the national BBWAA's Most Valuable Player voting ... was a finalist for the Rawlings Gold Glove Award ... among National League second basemen ranked third in fielding percentage (5e, 637tc) and from 5/7-8/15 produced a career-high 84-game errorless streak ... for the third straight season was rated by managers the NL's best defensive 2B ... among all Major League second basemen ranked fifth in HR, fourth in RBI and fourth in slugging (.430) ... led the club and ranked T6th in the National League with 52 multi-hit games...made 28 starts batting leadoff (.202, 3hr, 6rbi), 43 starts batting third (.298, 5hr, 21rbi) and 73 starts batting fourth (.303, 10hr, 50rbi) ... from 7/16-9/3, while Joey Votto was disabled took over the third spot in the batting order (.313, 5hr, 21rbi) and helped lead the Reds to a 32-16 record, the best in the Major Leagues during that span ... from 4/18-7/16 made 73 of his 75 apps batting cleanup (.303, 10hr, 50rbi)...the Reds went 43-30 (.589) when he hit fourth ...on 4/8 vs Mia singled off Carlos Zambrano to become the 28th player in Reds history to produce 1,000 hits ... his run-scoring single off Ivan Nova on 5/19 at NYY produced his 500th RBI as a Red ... from 6/12-6/15 homered in a career-high 3 straight games (9rbi) ... during the Division Series vs SF was the only player to hit safely in all 5g of the series ... led all players in the NLDS with 9 hits, 3 doubles and 7rbi ... in Game 1 became the third Reds player with at least 3 hits and 3rbi in a single Postseason game since RBI became an official statistic in 1920 (Tony Perez, Game 2, 1975 NLCS vs Pit & Mariano Duncan, Game 3, 1990 NLCS vs Pit). Was 1 of only 6 players voted to the All-Star team who also won bothRawlings Gold Glove and Louisville Silver Slugger Awards (Troy Tulowitzki, Matt Kemp,Adrian Gonzalez, Jacoby Ellsbury, Adrian Beltre)...was a National League All-Starfor the second time and a Sporting News NL All-Star for the first time...won his firstSilver Slugger and his third Gold Glove in the last 4 seasons...is the first Reds secondbaseman ever to win the Silver Slugger and the first Reds player to win the Gold Gloveand Silver Slugger in the same season since SS Barry Larkin did it in 1995 and 1996...in plate apps as a second baseman led the NL in hitting (.299), on-base percentage(.352), runs (92), hits (182) and doubles (38) while ranking second in RBI (81, Pit'sNeil Walker 83) and slugging percentage (.452, Mil's Rickie Weeks .453)...among allleague leaders ranked T4th in doubles, T5th in multi-hit games (55), seventh in hitsand T9th in runs scored...was rated by field managers as the best defensive secondbaseman in the NL...ranked second in the National League in fielding percentage by a second baseman withat least 551 chances (.99167, 6e, 721tc), just .00064 percentage points behind Pit's Neil Walker (.99231,6e, 781tc)...hit exactly .300...was 1 of only 31 Major League players to hit at least .300...became the seventhReds second baseman since 1919 to hit .300 and the first to do it in a non-strike season since Joe Morganhit .320 in 1976 (Bret Boone .318 in 1994, Joe Morgan twice, Pete Rose twice, Johnny Temple 3 times, TonyCuccinello, Hughie Critz)...his .300ba and 38 doubles were career highs...the Reds went 20-18 after he movedinto the leadoff spot on 8/17, his only starts of the season batting first...in those 38 apps batting leadoff hit .350(55-157, 12 2b, 1 3b, 7hr, 19rbi, 7sb, 29r), raising BA from .283 to .300...led the team with 55 starts battingsecond (.292)...made his other 55 starts batting cleanup (.269), second on the club to Jay Bruce's 62 startsthere...his 13-game hitting streak from 8/17-8/30 was the longest by a Reds batter in 2011 (.429, 1hr, 10rbi,10r)...also had a pair of 11-game hitting streaks (5/9-5/20, 7/22-8/1)...was the only Reds player to producemultiple hitting streaks longer than 10g...in the 8-2 loss on 7/1 vs Cle had 3 of the Reds' 5 hits and homeredtwice for career hits number 999 (off Justin Masterson) and 1,000 (off Chad Durbin)...was his seventh career2-homer game...produced another 2-homer game on 9/12 vs Cubs (both off Rodrigo Lopez)...in the 6-5 winon 7/15 vs StL, the first game after the All-Star break, hit his secondcareer walkoff HR (2-run off Fernando Salas)...his sacrifice fly offRyan Vogelsong on 7/29 vs SF produced his 500th career RBI...from 8/7-8/13 missed 6 starts with a sprained right ankle (2gs) andthen a bruised left elbow (4gs)...in the seventh inning of the 10-7loss on 8/8 vs Col hit his second career pinch-hit HR, a solo shotoff Rex Brothers that tied it at 7-7...was his first appearance sincehe left a game 2 days earlier with the sprained ankle and his onlypinch-hit appearance of the season...on 8/9 vs Col made the 1,000thappearance of his career, was hit on the left elbow by an EsmilRogers pitch and missed 4g...on 9/12 and 9/13 vs Chi homered inconsecutive games for the first time all season (3hr, 4rbi), includinga pair of HR in the first game followed the next night by his secondcareer leadoff HR (off Ryan Dempster), then did it for the secondtime on 9/19 and 9/20 vs Hou (2hr, 2rbi)...hit his second leadoff HRof the season on 9/19 vs Hou (off J.A. Happ). Was a National League All-Star for the first time...forthe second time in 3 seasons won the Rawlings Gold Glove Awardfor second basemen...produced the highest fielding percentage of anyNL second baseman who had at least 500 total chances (.996, 3e,703tc)...also led all NL second basemen in assists (419)...committeda career-low 3 errors, just 1 more than the franchise record forfewest by a second baseman in a season (Bret Boone, 2e, 1997)...from 6/17-9/6 produced a season-best 63-game errorless streak...inBaseball America's Best Tools issue was voted the best fielding secondbaseman in the league...was 1 of only 3 players in the Major Leagueswith at least 100 runs, 33 doubles, 18 homers and 16 steals (CarlosGonzalez, Joey Votto)...from 8/27-9/1 missed 6 starts with a swollenright hand suffered at SF on 8/25, when he was hit by a SantiagoCasilla pitch...in 28 apps after he returned hit .198 (21-106), but inhis last 11 apps of the season hit .353 (12-34, 2hr, 7rbi)...produced18hr, 59rbi, 16 steals and 100 runs scored while making most of hisstarts from the leadoff spot...beginning 6/25 became the club's primaryleadoff hitter and made 70 of his last 79 starts batting in that spot in theorder...overall in the order hit first (team-high 72gs), second (46gs),third (8gs), fourth (22gs), sixth (2gs) and seventh (1gs, 9/25at SD)...were his first apps batting leadoff since April 2007, his first startsbatting second since 2008 and his only start batting seventh since 2006...established career highs in doubles(33) and walks (46)...ranked T7th in the NL in runs scored...when he suffered his hand injury on 8/25 led the National League in runs scored (90) and hits (151)...finished the seasonleading the team in apps (155) and 4-hit games (4)...his 15-game hittingstreak (.463) from 5/28-6/12 was the longest by a Reds batter in 2010...on 5/25 vs Pit hit his 100th career HR (off Joel Hanrahan)...on 6/10 vs SFbatted leadoff for the first time in 2010 and for the 12th time in his careerand tied his career high with 4 hits...on 7/28 at Mil hit his fourth career grandslam, a 450-foot shot off Bernie Brewer's slide (off Carlos Villanueva)...in the 3-1 win on 8/20 at LAD drove in all 3 runs to help the Reds snaptheir 12-game losing streak at Dodger Stadium dating back to 2005...hit 2homers on 8/24 at SF...after the Reds were no-hit by Roy Halladay at Phiin Game 1 of the National League Division Series, Phillips led off Game 2with a homer off Roy Oswalt...was his first career leadoff HR and only thesecond leadoff homer in Reds postseason history (Pete Rose, Game 5 ofthe 1972 World Series off Oak's Catfish Hunter). For the second time in 3 years won the Ernie LombardiAward as the Reds' Most Valuable Player in voting of the local chapterof the Baseball Writers' Association of America...led all National Leaguesecond basemen with 25 stolen bases (Chase Utley 23) and 98rbi (Utley93) and ranked fourth with 20hr (Utley 31, Dan Uggla 31, Clint Barmes23)...led the team in apps (153), starts (150), hits (161), RBI (98), stolenbases (25, tied w/ Willy Taveras) and 3-hit games (11)...produced 3rbiin the season finale to finish with a career-high 98, the second-highesttotal ever by a Reds second baseman (Joe Morgan, 110rbi as 2B in1976)...produced his 95th RBI on 9/24, then until the final game went 8apps without driving in a run, his second-longest drought of the season...also had a career-best 30 doubles and 44 walks...became the first playerin franchise history to produce at least 20 doubles, 20hr and 20 stolenbases in 3 consecutive seasons...joined Fla's Hanley Ramirez as theonly players in the Major Leagues to do it each of the last 3 years...in hislast 23g of the season hit .301 (28-93, 1hr, 13rbi)...led the club with 122starts batting fourth in the order but also hit third (26gs) while Joey Vottowas on the disabled list and sixth (2gs)...on 4/22 and 4/23 at Chi battedsixth, his lowest spot since he hit sixth on 4/11/07 at Ari...in the 7-0 winon 5/5 at Fla drove in 6 runs for the third time in his career...were the most RBI in a game by a Reds batterall season...in the 2-0 win on 4/12 vs Pit provided the game's only runs with a first-inning HR off Ian Snell...on 4/13 at Mil scored the 300th run of his career...from 5/1-5/16 hit .362 (4hr, 20rbi) during a season-high 13-game hitting streak that raised his BA from .188 to .268...on abad hop on 5/23 vs Cle suffered a hairline fracture at the tip of hisright thumb...missed 5g but did not go on the disabled list...in Mayreceived votes for National League Player of the Month after hitting.352 with 7hr and leading the team with 31 hits and 29rbi...were themost RBI by a Reds batter in a calendar month since Adam Dunn's31rbi in July 2005...on 6/3 at StL produced 3 hits, a homer, 3 RBI,3 runs scored and 2 stolen bases...since 1920, when RBI becamean official statistic, only 2 other Reds players reached all 5 of thosestatistical levels in a game: George Foster in 1976 and Gary Redusin 1983...on 6/28 at Cle celebrated his 28th birthday by going 3-for-5with 3rbi, a stolen base and 3 runs scored...in the 4-3 win on 7/7 at Phihad 3rbi and his fifth career 2-homer game...on 7/25 at Chi recordedhis 100th career stolen base. Didn't play after 9/9 because of a broken right indexfinger that required surgery to insert 2 pins (9/12, hand specialist Dr.Andrew Markewicz, Dr. Timothy Kremchek)...won the Rawlings GoldGlove Award for National League second basemen and the Bill James Handbook's Fielding Bible Award asthe best defensive second basemen in the Major Leagues...for the secondconsecutive season led National League second basemen in fieldingpercentage (.990, 7e, 706tc)...his career-high 78-game errorless streakfrom 4/10-7/8 was the second-longest by a second baseman in the MajorLeagues in 2008 (Pit's Freddy Sanchez, 82g)...despite missing the last17g of the season still led the team in multi-hit games (45), stolen bases(23), run scored (80) and triples (7)...ranked T6th in the NL in triples...ledthe club with 114 starts batting cleanup but also hit second (2gs) and third(24gs)...when injured had appeared in 141 of the Reds' 145g and hadstarted 140g...missed only games on 4/17 at Chi, the nightcap of a DH on5/10 at NYM, 6/11 vs StL and 8/31 vs SF...on 4/25 at SF made his onlyappearance of the season as a pinch hitter and hit his first career pinchhitHR (off Jonathan Sanchez)...in 26g from 5/20-6/17 hit .188, droppingoverall BA from .308 to .262...in his other 115 apps of the season hit.278...on 4/27 at SF produced his fourth career 2-homer game (solos offPat Misch)...on 6/4 at Phi made his 500th career appearance...on 6/19 vsLAD produced his 500th career hit, a 2-run single off Jonathan Broxton...in the 3-2 victory vs Wsh on 7/5 produced his third career walkoff hit,an RBI-single off Luis Ayala...on 8/6 vs Mil and 8/7 vs Hou became thefirst player in the 6-season history of Great American Ball Park to triplein consecutive games...on 8/29 vs SF recorded his 200th career double (off Barry Zito)...suffered his season-ending finger injury in the 11-inning,5-4 win on 9/9 at Mil...was hit by a pitch on a bunt attempt but later in thatplate appearance drove in the game-winning run...on 9/12 went on the60-day disabled list to make room on the roster for RHP Micah Owings,who was acquired from the Diamondbacks to complete the Adam Dunntrade...for his community service was the club's recipient of the RobertoClemente Award and its nominee for the Branch Rickey Award. Put together one of the best all-around seasons of anyplayer in baseball and was voted the club's Most Valuable Player by thelocal chapter of the BBWAA...received votes for National League SilverSlugger, Gold Glove and MVP awards...established single-season clubrecords for a second baseman in total bases (315) and home runs (30)...joined Adam Dunn (40hr) and Ken Griffey Jr. (30) to tie the club recordfor most players with 30 homers in the same season...became only thesecond 2B in Major League history, the third Reds player and the 31stplayer overall (51st time) to produce 30 homers and 30 stolen bases in aseason (30hr, 32sb)...led all National League second basemen in fieldingpercentage (8e, .990), total chances (782), putouts (341) and assists(433)...among all ML second basemen ranked in the Top 3 in almost everymajor offensive category...led the Reds in games (158), runs (107), hits(187), total bases, triples (6), stolen bases and multi-hit games (56)...for the second straight season led the club in hits and multi-hit games...ranked among the National League leaders in multi-hit games (T7th),runs (9th) and stolen bases (T9th)...tied for the NL lead among secondbaseman in steals after leading league 2B in thefts in 2006...led the clubwith 52 starts batting second in the order and 81 starts batting fourth...were his first career apps batting cleanup...made 154 starts overall, all at2B...made 1 appearance at SS (7/25 vs Mil)...in July led the club in HR(6) and RBI (24)...in his last 41g of the season hit .339 (9hr, 28rbi)...on9/4 vs NYM hit his 27th homer of the season (off Scott Schoeneweis) totie Joe Morgan's club record for a second baseman...broke the record thenext day (off NYM's John Maine)...recorded his 30th stolen base on 9/12vs StL and his 30th homer on 9/26 vs Hou (off Juan Gutierrez)...on 9/16at Mil doubled off Matt Wise to become the first Reds second basemanever to produce 300 total bases...his career-high 22-game hitting streak from 4/26-5/20 was the longest by aReds batter since Hal Morris hit safely in his last 29 apps of the 1996 season and tied for the second-longestin the league in 2007...became the 12th Reds player to produce a hitting streak of at least 22g (16th time)...during the streak he hit .351 with 11 multi-hit games and raised overall BA from .222 to .292...also had a pairof 11-game hitting streaks (.375 from 7/1-7/15, .449 from 8/21-8/31)...from 8/24-8/30 produced a career-best 7 consecutive multi-hit games (.353, 16-30), the longest such streak bya Reds batter since Chris Stynes' 8-game multi-hit streak from 7/8-7/18,2000...his career-high 6rbi on 7/13 at NYM were the most by a Reds batterin a game all season...had a 2-homer game on 6/22 at Sea and a pair ofgrand slams (7/3 vs SF off Kevin Correia, 7/13 at NYM off John Maine)...in the 2-1 victory on 4/20 vs Hou drove in the game-ending run in the 10thinning with an RBI-single off Tom Gordon...on 6/17 vs Tex left the gameafter he was hit on the left hand by a Kevin Milwood pitch but didn't missa start...in front of his hometown crowd on 7/18 at Atl, his 2-run double inthe 15th inning lifted the Reds to a 5-4 win...on 8/1 at Wsh recorded his20th and 21st stolen bases of the season on the same pitch, thanks to ashift on batter Adam Dunn. In his first season with the Reds became theclub's starting second baseman...led the team in hits (148),multi-hit games (36) and starts at 2B (136)...also made 3 appsand 2 starts at SS...led all National League second basemenin stolen bases (25)...on 4/1 was designated for assignment bythe Indians...6 days later was acquired by the Reds for a playerto be named later or cash...on 4/9 was added to the roster...on 4/16 became the club's starting 2B and from4/17-4/23 was NL Player of the Week (.452, 4 2b, 3hr, 17rbi)...his 17rbi were the most by a Reds batter in a7-day span since Ray Knight produced 17rbi and 18rbi in July/August 1979...hit safely in all 7g that week andthen extended that career-high hitting streak to 9g (4/17-4/25, .421, 4 2b, 3hr, 18rbi)...kicked off that awardwinningweek on 4/17 vs Fla with 3 hits and 4rbi...on 4/20 at Mil had 6rbi, the most by a Reds batter all season,including 2 homers and his first career grand slam (off Mike Adams)...would produce 2 more 9-game hittingstreaks as part of a stretch from 6/16-7/5 during which he hit safely in 18-19g (.381), raising BA from .303 to.322...began the season with 16 straight stolen bases until he was picked off/caught stealing by Mil's DougDavis on 7/4...was the first Reds baserunner to begin a season with 16 consecutive successful stolen baseattempts since Ken Griffey Sr. opened the 1980 campaign 19-for-19...was hitting .306 with 7hr, 44rbi and 16stolen bases in 17 attempts at the All-Star break...through August was hitting .301 (124g, 15hr, 66rbi, 22sb)...in September was bothered by a bruised left index finger and hit .149...made his only starts at SS on 9/22 vsChi and 9/23 vs Chi...were his first career starts at that position...led the club with 66 starts batting seventhbut also hit first (9gs), second (16gs), third (1gs, 7/2 vs Cle), fifth (1gs, 7/7 at Atl), sixth (28gs), eighth (15gs)and ninth (2gs)...on 9/19 at Hou was hit in the left eye by a ball but missed just 1g. At Class AAA Buffalo appeared in 112g and was selected to play in the Triple-A All-Star Game...ranked fifthin the Indians organization in runs scored (79)...also appeared in 6g for the Indians during a stint from 7/9-7/31...madea couple starts at 2B, on 7/9 and 7/20...after he returned to Buffalo hit .259 the rest of the season...missed 3g in earlyJuly with a bruised right hand suffered when he was hit by a pitch...produced a pair of 4-hit games...made 104 startsbatting leadoff. Spent the minor league season at Class AAA Buffalo, where in 135 apps he hit .303 with 14 stolenbases for the International League champions...ranked fourth in the IL in hits (158), T6th in runs scored (83)and T8th in doubles (34)...his 158 hits would have established a new Bisons modern record had teammateJhonny Peralta not produced 181 hits...for Buffalo made 69 apps at 2B and 66 apps at SS...in June and Julycombined to hit .345...from 6/20-7/30 hit safely in 34-35g, including an 18-game hitting streak from 6/20-7/10and a 16-game streak from 7/11-7/30...from 6/15-8/10 reached base safely in 51 straight games, a Bisonsmodern day record and a minor league high for 2004...during that 51-game span hit .365 with a .431 on-basepercentage...hit .308 in the playoffs...on 9/19 joined the Indians following the minor league post-season...made 6 starts at 2B for the Tribe. Coming out of spring training won the Indians'starting job at second base...hit .277 in 24 exhibitiongames to earn his spot in the Opening Day lineup...played in a career-high 112g for the Tribe...on 4/9 vsWSox hit his first Major League home run (off JonGarland)...from 5/8-5/14 produced a season-high6-game hitting streak (10-21, .476)...on 5/20 vs Dethit a 3-run walkoff homer off Matt Roney that eraseda 4-3 deficit...in that game produced a career-high4rbi...from 5/27-6/6 went 0-for-29 and at the All-Starbreak was optioned to Class AAA Buffalo...in 88gat the break was hitting .210, the lowest average inthe American League among batting qualifiers...hit .175 in 43g at Buffalo but was recalled on 8/27, when John McDonald went to the disabled list...spent theremainder of the season with the Tribe and hit .200 in 24g the rest of the season...for the season made 104starts at 2B...his .981 fielding percentage ranked seventh-best among all AL second basemen. Prior to the season was rated by Baseball America as the top prospect in the Expos organization andthe 20th-best prospect in all of baseball...in his Major League debut made 11 apps for the Indians...spentthe minor league season at Class AA Harrisburg and Class AAA Ottawa and Buffalo...in June was acquiredby the Indians in the deal that sent RHP Bartolo Colon to Mtl...began the season at Harrisburg and hit .327in his first 60g there before he was promoted to Ottawa on 6/14...for Harrisburg produced a 21-game hittingstreak from 4/6-5/3 (.410)...was named Eastern League Player of the Month for April (.397, 6hr, 17rbi)...had2-homer games on 4/13 vs Altoona and 5/27 vs Binghamton...following the 6/27 trade went to Buffalo andhit .283 in 55g there...on 9/13 was promoted to Cle and made his Major League debut that night vs Min as adefensive replacement at 2B...on 9/16 at Bos singled off Frank Castillo for his first career hit...on 9/26 at Minwent 3-for-4 with 2 doubles, a triple and a career-high 4rbi...overall for Cle made 11 apps at 2B, including 8starts...following the season played for Phoenix in the prestigious Arizona Fall League (32g, .238, 4hr, 20rbi,5sb)...following the season was named the top prospect in the Indians organization by Baseball America. At Class A Cape Fear of the South Atlantic League recorded 23 stolen bases in 31 attempts. Signed his first professional contract on 6/21...appeared in 47g for theGulf Coast League Expos. October 29, 2018 2B Brandon Phillips elected free agency. September 4, 2018 Boston Red Sox selected the contract of 2B Brandon Phillips from Pawtucket Red Sox. July 14, 2018 2B Brandon Phillips assigned to Pawtucket Red Sox from Lowell Spinners. July 7, 2018 2B Brandon Phillips assigned to Lowell Spinners. July 5, 2018 2B Brandon Phillips assigned to Pawtucket Red Sox. 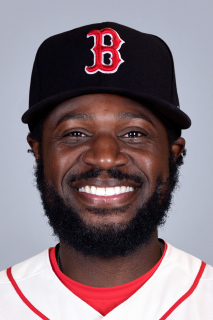 June 27, 2018 Boston Red Sox signed free agent 2B Brandon Phillips to a minor league contract. November 2, 2017 2B Brandon Phillips elected free agency. February 12, 2017 Cincinnati Reds traded 2B Brandon Phillips to Atlanta Braves for LHP Andrew McKirahan and RHP Carlos Portuondo. August 18, 2014 Cincinnati Reds activated 2B Brandon Phillips from the 15-day disabled list. August 17, 2014 Cincinnati Reds sent 2B Brandon Phillips on a rehab assignment to Dayton Dragons. August 15, 2014 Cincinnati Reds sent 2B Brandon Phillips on a rehab assignment to Louisville Bats. June 28, 2013 Cincinnati Reds activated 2B Brandon Phillips from the paternity list. June 24, 2013 Cincinnati Reds placed 2B Brandon Phillips on the paternity list. June 21, 1999 Montreal Expos signed SS Brandon Phillips.